Charlie's first model of Phil's Chevelle sits on a set of kit tires that feature Rally wheels from the partsbox and Shabo dry transfer lettering. 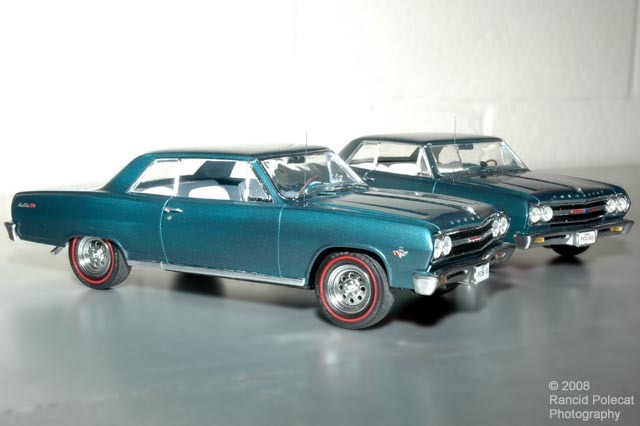 To keep up with the work Phil did on his car, Charlie set the second model on a set of resin redline tires from the Replicas and Miniatures Company of Maryland. This resin rolling stock is fitted to a set of Drag Lite wheels from Competition Resins. The Drag Lites are, like the front and rear bumpers, painted with Alclad-II Chrome paint. Inside both models, Charlie fitted the kit shifter with scratchbuilt handles, replicating Phil's Hurst T-handle shifter. The steering wheels and dash trim are Model Car Garage units. The floors are carpeted with Ken's Fuzzy Furr.